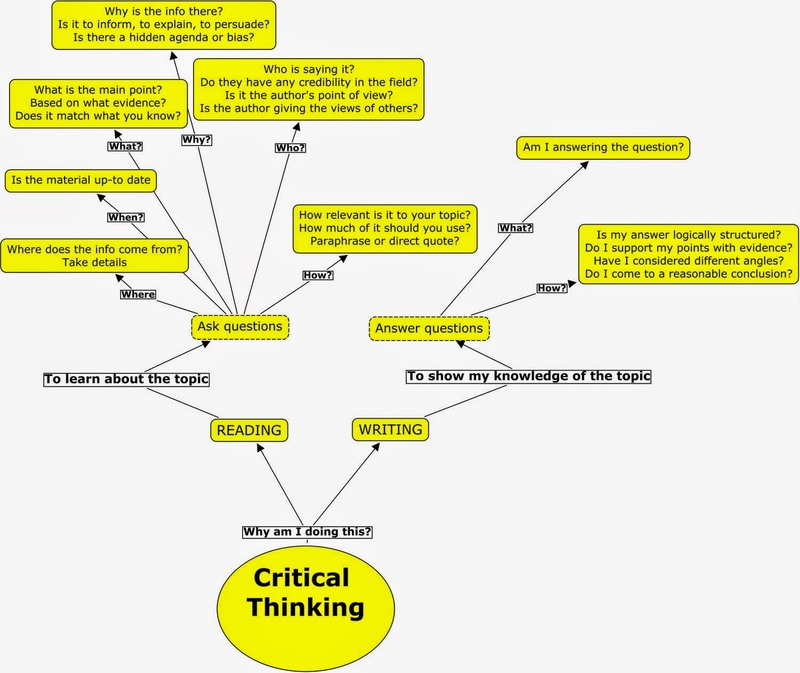 Critical learning/reading/living is an acclaimed skill. With the internet becoming a global content delivery and discussion forum, this skill has become increasingly important for knowledge creation, filtering out crap and manipulation, or simply in order to try and construct your own voice in your own field of interest. As my Personal Knowledge Mastery class facilitated by Harold Jarche moves forward, this is my next reflective exercise. For last weeks topic was on: challenging ideas and why this is a good thing. Being critical is also a key aspect of any PhD or research project. Knowing which terms you use, why you select certain methodologies, whether they stand the test of critical analysis, what weaknesses/strengths they have. Looking back at when I started with my PhD I can see how I have strengthened my critical skills. The verbs I use, the arguments I make, the data I collect and how I analyse that data, everything is scrutinized and rightfully so, as this turns simple actions into conscious, meaningful acts. And in order to enhance these critical skills, feedback from colleagues and supervisors is more then helpful. This was not new to me, as I used it to evaluate eLearning and mobile projects in the past, but really improving that skill will have a profound effect on my future evaluations, and understandings. A clear gain from my PhD journey. In the PKM course an example from the military is given reflecting on the "Red Team University", a university which trains critical people to be send out into the field and use their critical skills to improve field actions and strategies (so those people question the military staff in order to strengthen tactics), here is the excerpt:. The school is the hub of an effort to train professional military “devil’s advocates” — field operatives who bring critical thinking to the battlefield and help commanding officers avoid the perils of overconfidence, strategic brittleness, and groupthink. The goal is to respectfully help leaders in complex situations unearth untested assumptions, consider alternative interpretations and “think like the other” without sapping unit cohesion or morale, and while retaining their values.More than 300 of these professional skeptics have since graduated from the program, and have fanned out through the Army’s ranks. Their effects have been transformational — not only shaping a broad array of decisions and tactics, but also spreading a form of cultural change appropriate for both the institution and the complex times in which it now both fights and keeps the peace. When watching an interview for the Screen Actors Guild with Cate Blanchett on her performance in Blue Jasmine, in the end one of the questions from the public is on self-doubt and reflection. Although Cate Blanchett has performed numerous times on both theater and film stage, she clearly defines doubt and critical thought as defining her expertise, as fine-tuning her performance. A nice interview. While exploring OER with an edge options, I came across this free book published by the Common Wealth of Learning, edited by Ferreira and Gaultier, entitled Perspectives on Open and Distance Learning: Open Schooling with Open Educational Resources (OER): opening doors, creating opportunities. A great read which features OER cases from six countries — Botswana, Lesotho, Namibia, Seychelles, Trinidad and Tobago and Zambia — participating in this ambitious, ground-breaking project to train educators to create a bank of OER that could be used in both conventional and open schools by both school-age children and adult learners. Each country based its OER on its country curricula, but built in enough cultural and pedagogical flexibility to allow the OER to be used and adapted by other countries — epitomising the essence of OER. In addition, the training equipped the participants with the knowledge and skills to train current and future colleagues, thus contributing to the sustainability of the OER. The project presented many challenges — technical, personal and logistical — for the participants and these are discussed openly and honestly in the country reports. It also brought a real sense of professional and personal achievement, and those who participated can be proud of their contribution to the development of OER for open and distance education. If we can continue to develop and maintain OER, we can continue to educate and to open doors. The great part of this is the collaboration to get OER centralized across nations, and using it inside of a curriculum based system (which makes the OER open to qualitative evaluation, redistribution, cross-cultural affinity...). Just looking at the table provided by the Namibian OER team got me excited: a clear timeline of what has been done, how and what the main focus was. A couple of days ago I got hooked on the British Pathé news reels, and here are three wonderful mobile phone related bits of movie. As an adapt mobile learning enthusiast and researcher, I just got so enthusiastic about these bits of moving history. And when looking at them I think: the same ideas are in all of our minds, whether the technology enables them or not. 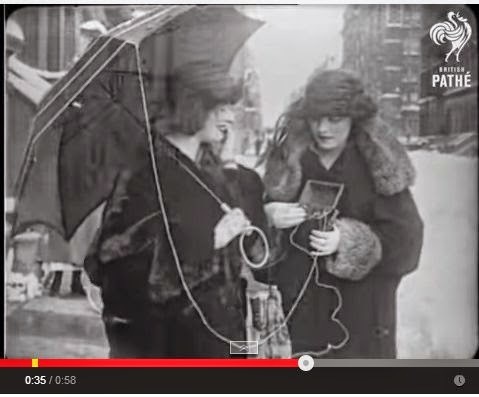 The first dates back to 1922 and is called Eve's wireless, and it seems this movie accounts the "Home-O-Fone", which is based on the crystal radio (ah memories of my childhood electronic play-set that offered me a crystal radio as an easy bit of DIY option). In that movie you see two women walking down the street and letting 'hubby' know they will be late. Using a fire hydrant for grounding, and an umbrella as an antenna... great! And what do they phone? A record operator! Or at least it seems that way. The lady who first seemed like a phone operator puts on a record and presto, music can be heard in the street. The movie is called Rome: Auto Telephone, but the description says Napoli, Italy. A third movie dates from 1946, and is entitled: Madame will you walk and talk. In this movie you see a woman making use of a (hefty) mobile phone option, to keep her (lady)friends on top of what is on sales or not, or getting a knowledgeable man to get the car going again, and the last scene of this movie has a homely feel (ducking behind my chair for the remarks that will no doubt be voiced by my feminist friends). The Open Praxis special issue from the Open CourseWare Conferenence (OCW) 2014 that took place in Ljubliana, Slovenia is just published. This issue features a selection of papers. I gladly include the list of papers at the end of this blogpost, but first starting with an article and research that I found particularly useful. 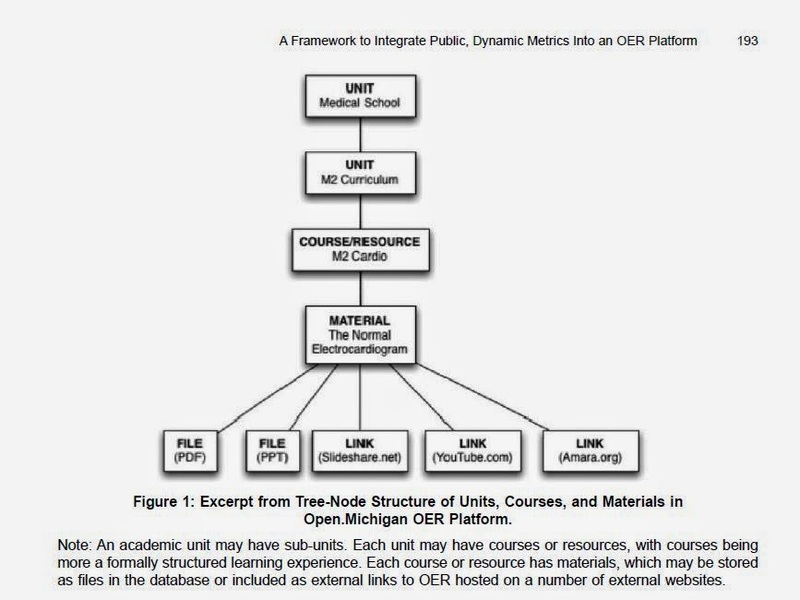 The most interesting for my research and online learning interests was the one from Cohen, Omollo and Malicke which was an article on "a Framework to Integrate Public, Dynamic Metrics Into an OER Platform". The authors look at the usefulness of opening up meaningful analytics coming from shared Open Educational Resources (OER). I find this of interest, as it is part of something I want to investigate in relationship to peer/expert knowledge creation, MOOC, mobile learning. This paper provides an overview of what the university of Michigan, USA has done, but it can easily be rolled out to other educational and training institutes or organizations, even - in my view - to an international modus operandi. Metric-sharing is currency in relationships between OER-publishing-platforms and the faculty, staff, and students of universities and businesses who create OER. This is not the only benefit, but it has been a clear one for us: we are giving a population we have identified as a primary audience something they want. Our experience and user research confirm this. The technical architecture an organization uses to host and reference OER is tied closely to the organization’s ability to share detailed usage data for its OER. Our use of the hierarchical structure of a Drupal-based platform allows us to easily provide metrics for individual courses or resources. Metrics on a small scale are interesting, especially to their creators. Metrics can inform qualitative investigation, but they do not answer “why” questions (e.g. “why does this course have so many downloads compared to this other?”). To find analytics, metrics are necessary, but not sufficient. Due to the structure by which OERbit platform stores metadata, Open.Michigan can group OER and its associated metrics in various ways. This positions Open.Michigan to progress from dynamic metrics to dynamic analytics in the future. Much like seeing nodding and note-taking when you speak in front of an auditorium, seeing evidence of views, downloads, or comments where your OER are published is validation, evidence that there is some likelihood your effort provides real value to others. Having that evidence allows many to justify the additional effort it may take to openly license educational materials to supervisors and administrators. Open.Michigan’s sharing of individual OER metrics sustains development of open resources and allows an open education initiative, such as ours, to build strong relationships with its surrounding community and thus support the development and sharing of OER on a larger scale. The above article matches in nicely with the OER and MOOC related article authored by Fernández and Webster (University of Madrid) which described "From OCW to MOOC: deployment of OERs in a MOOC, the experience of Universidad Carlos III in Madrid"
History from British Pathé movies a treasure trove! As an avid movie lover and ex-movie critique, I was jumping into the air when I saw the British Pathé journals are opened (while I was on holiday, how dare they! ), and are now freely available on their YouTube channel. There is an easy option to subscribe to specific British Pathé channels as well (sportinghistory, vintageFashion). Hopefully innovation will get its own channel soon as well, but fortunately it already has its own collection of movies organized under fantastic innovations. The movie archive is a treasure trove for any teacher/trainer/history lover. First thing I did was get hold of the copyright on these movies. Because I wondered whether all these movies could be seen as Open Resources, potentially Open Educational Resources (OER). And whether any teacher could use the movies to rehash and make it a rich fit for their own training or teaching purposes. On their Pathé website the copyright is fully reserved, and while looking for YouTube licenses, I do have the impression the standard license is the one used. So it might not be that easy to use footage, or mix it into content that fits your learning goals. I do wonder how much footage can be used for educational purposes (should mail and ask). Although this is clearly a great set that gives all of us a look into world history, it does come with its own zeitgeist, and its own gatekeepers eye. But then history is always an account of those who have the technology, the knowledge and the vision. The fact that the archive is set free, is like wandering into a movie library ... marvelous, I found 'unused, unissued material' as an anchor point to find fabulous raw movie stuff. For one: suffragette material: women workers (factory girls) roaming the streets of Camden while being on strike, followed by a 66.000 rich female pageant through London, and of course Emily Davison who jumped onto a horse track and got killed in an attempt to pull down the Kings Horse in 1913, and more (e.g. 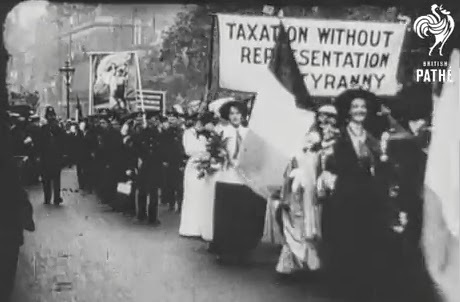 Taxation without Representation is Tyranny". 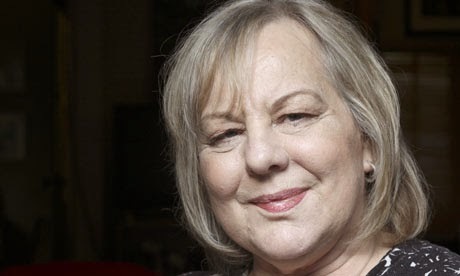 This morning sad news was announced as the author Sue Townsend died (well known for her Adrian Mole books, but all round prolific and wonderful writer). Two days ago I finished her book “The woman who went to bed for a year”, a book that compelled me to laugh out loud, reflect upon the spirits of people, and of whom at the end cares the most for each one of us. I really enjoyed the book. As I read the back end of the book two facts sparked an extra, personal interest: blind, kidney transplant. Linking those two together I immediately thought of diabetes complications. After a quick search I found Sue Townsend was just like me a diabetes type 1 person since the 80’s. After reading it, I tucked my feelings on these two facts away to the back of my head. This morning those feelings stormed to the front again as I read that Sue Townsend was dead. That fact scared the hell out of me. I saw the upcoming years: loosing eye sight, reduced – stopped - kidney function, stroke. I am scared of endings, I am scared of death, scared for me, for my loved ones, for the unknown, for the reducing of my own autonomy. A letter came a month ago, that I needed to get my eye screening appointment set, I had ignored it. Why? Because I am scared of my own disease at times, and I have the tendency to flee from personal topics of anxiety. I know fleeing never helps on such occasions, but it is clinging on to the utopia of life and how I imagine it: ideal, healthy. So, an hour ago I got up, picked up the phone and made the dreaded appointment. I need to stay in optimal condition for as long as possible, I owe it to my mum, my son, my partner and myself. We must all live our own life, with whatever life has in store for us. Being scared only helps in extreme situations where caution is needed, in all other occasions we must face fear, and tackle it by either learning on how to overcome it, or reflecting on what the real basis of this fear is. It also means one must understand and look for that which makes us tick. For me understanding the learning process, looking for solutions that involve technology is a pleasure. Research, talking, thinking. To me learning, either face-to-face, online, any type of blended, is necessary to direct all of us towards trust, life, joining hands. Learning from people we like, support us, whom we support. Professionally I am on a good track. Personally it is about connecting to people I care about. Partners, friends, colleagues (virtual and IRL), sharing, caring, supporting, dreaming. Easter is coming, the flowers are out, spring is shining, and at this point in time I live, I love and I am thankful for all the wonderful people and opportunities that surround me. Life is in the living. For what ever reason, I seem to have a personal complacency => failure => improvement cycle. Which means that every few years something that I was good at turns into mush. The latest one concerns presentation skills. So I have been good at it (why do I know: feedback forms, mouth to mouth) and then it turns bad (why do I know? Again feedback forms). I did feel myself slip, but I simply told myself 'I had a day off' and soothed me into not worrying. So what is the typical decay of my presentation skills: I know what I know, I actually know quite a bit about certain topics (mlearning, cMOOC), but then I want to share ALL that I know in one hour slot of presentation AND I rely on my brain to come up with structure ad hoc. This does not happen. use simple slides for presenting, and use notes to elaborate on your slides, or add audio so people understand the pictures you use (this means: I always think that slides can be used as content booklets (see my slides for yourself)... but I think I will just need to step away from that. Either present, or offer booklets I guess). As Marshall McLuhan said: the medium is the message , and I scrambled both up resulting in a confused feeling in the heads of the listeners. practice, practice, practice and get better. Why: I want to give pleasurable insights on topic into people's minds, not chaos! 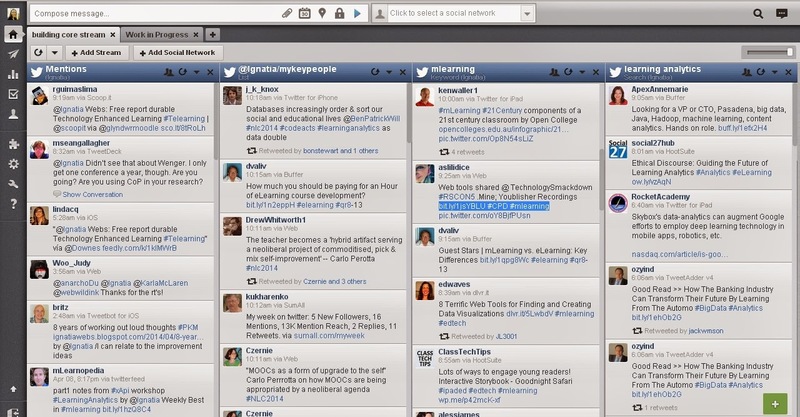 Julie Willemson ) Vulnerable Learners in MOOC which I linked to earlier. As the Personal Knowledge Management (PKM14) course moves into its second week, all the participants are asked to filter their social media / their networks. We are suggested to use more advanced filters: e.g. using feeds from people or/and groups, using automated filters of choice (e.g. hootsuite or tweetdeck to filter the personal twitter and other streams). First I took a look at hootsuite (suggested by Ronda Zelezny-Green) and tweetdeck (both of these are free to some extend. Another paid option is sproutsocial which has wonderful options, but fits more with an enterprise type of social media stream analysis. I tested both and looked at other user comparisons to get an idea of which tool would suit me. I had both used them briefly in the past, but not to their full potential. And as it has been some years now, it is clear that I am better at understanding what these types of tools can do, and the overall structure of the tools in themselves is an improved user experience as well. For me Hootsuite works (but without integrating it into my browser, that feature was the reason why I stopped using hootsuite in the past: too much bling makes me angry and puts me off a tool - but that is me, not the tool). After only two days, I already found some immediately relevant information (e.g. more status updates on learning analytics for informal learning, more about weak/strong ties in online communities), but at the same time I am loosing more time as I got lost in an information loop. Again... knowledge management is about finding useful tools, optimizing or personalizing them to fit your own goals, and limiting your time on those tools to get the best experience out of them (for me the best experience is: activating a peer network. One immediate benefit of Hootsuite is being able to schedule tweets, this saves time and will - eventually - keep me from returning to my streams in Hootsuite until a moment in time I consciously choose and limit. The information streams in Hootsuite are currently based on one list, and keywords (e.g. mLearning, learning analytics). I started to build MyKeyPeople list within twitter: adding those twitterers that are of importance to me, that provide new insights, links, ideas. But I do realize this is person-based, now - like a fellow participant Kavi (@_Kavi ) mentioned - knowledge can be distilled from a higher level by using twitter lists and combining these, or to search for good curators/curations and link these to a RSS/feedread or scoopit... I still have to work on those options. So that makes a good to do. Speaking of to do lists, another participant of the course (Shane Johnson) mentioned todoist, a cross-platform software to plan your time or project. Will have to see if this works for me. Almost groggy here after information overload and process... hoping still to make sense a bit. Great seminar! Which results in different learning designs. What different experiences do or could make up your blend of learning? 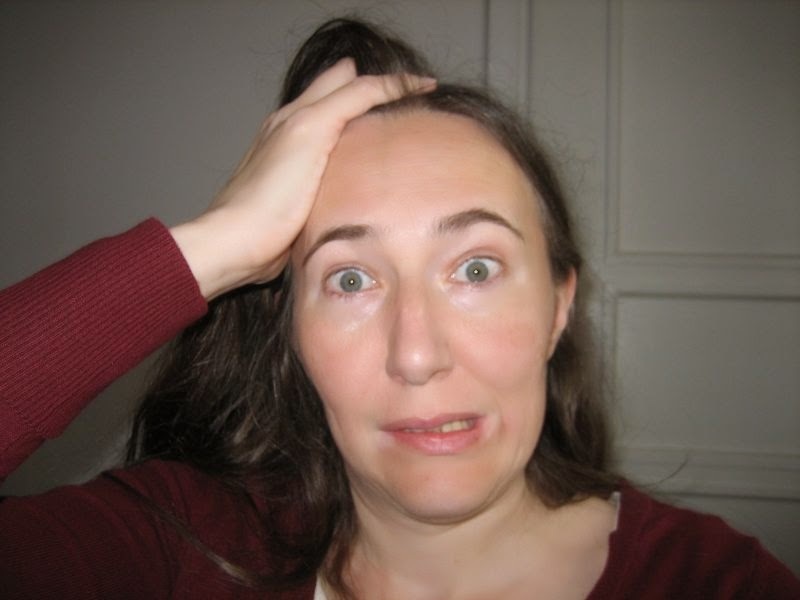 What is a natural flow for your learners? I did this => prove it! Will learners report their learning? Please complete this form => possibly NO (so what can we do to avoid this, or work around. What might be a benefit?) – e.g. training courses only made available to those who do send feedback. Joe moved this mouse 1 pixel => Which direction? 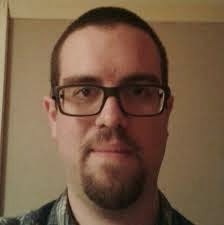 Part3 Ben Betts from HT2 on Learning Record Store and #xAPI of the seminar, part 1 including general links and frameworks can be seen here, part 2 focusing more on tools can be found here. xAPI (official name) and Tin Can are two names but covering the same thing, bit different ownership. Ben looks at the anatomy of a statement (showing it IRL). each verb used needs to be VERY WELL DEFINED, at this point in time you need to be VERY standardized. E.g. enter : this verb can cover multiple options, so definition is key to make the LRS meaningful. Also shows an example of xAPI integration in Google Chrome, which when clicked in that box of Google Chrome is immediately fed back as a statement to xAPI. I was bemoaning social learning, e.g. 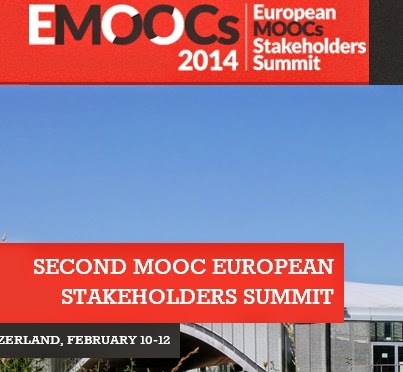 MOOC learning, how much is done by the learner, yet is lost both for the learner and for the learning system. Data gathering must be such that meaning can be taken out by other systems. Validation of actions is made much easier when observation is put into the equation: if someone else has seen you doing an activity and endorses it, you can believe the action actually took place. So a couple of experiments was done: one was on giving the learners some data to build upon (like a customer card, filled from the start with 3 stamps => more motivating!). Ben uses it to power Open Badges from Mozilla (great for informal mooc learning), xAPI provide an underlying layer for a badge: if you do this, this and this…. You get a badge. And a key attribute of LRS is, that you MUST be able to put it in another LRS (think SCORM). So buying LRS needs to be critical. Consider the data supply chain – show does data flow through your organization? This might provide the flipped solicitation room, as the facts of what you know can be seen pre-interview, real action during interview. Can xAPI be implemented in smaller systems, e.g. Wordpress? It is possible, but you need to plan enormously up front: REALLY know what you want to track, and how you call it, and how it must be put in. The instrument must use VERY TIGHT TAG architecture, really defining the meta-tags and the way the people must do it, in order to be able to analyse it. By using Experience API, xAPI, learning experiences can be logged anywhere, trackable beyond the way you’ve ever imagined. xAPI brings new possibilities to every traditional learning standard, including e-Portfolio and SCORM. The statements are in the form of “Actor”+”Verb”+”Object”+…. But, we don’t think the “Actor” is only a puppet in a given story. They are characters in their own stories and in peers’ stories. Learner-generated-learning is one of the most desirable learning moments, isn’t it? xAPI enables data driven design, the data can form a feedback mechanism for learning designers, but also for learners – who should be the co-designers of learning experiences. Furthermore, the autonomy of a learner DOES tell something about him. We are creating an online course exploring how to leverage xAPI to answer lots of questions — “Learning Architect”. Please register if you’re interested, we’ll inform you when it’s ready. We invite you to join the journey with us. Context: eLearning company which uses a lot of 3rd party content and has their own learning management system. Baking Tin Cans: where are we today? iSpring (Russian company based) works also nicely with Tin Can. Publishing to Tin Can is easier, as it has their own tab for it. It works similar to articulate: it starts where course was left off, you need to be online, but the tracking for non-assessments is not yet ideal. Using easy copy paste to add bookmarks to the LMS. In the past I wrote posts on the xAPI (first one in 2011 launching brainstorm, an update on the project in 2012, and one where the project is getting up to speed in 2013) which is in continued development and seems promising for learner analytics, especially the mobile options. This set of notes is 1/4, the others notes from this workshop can be found here: part2/4 (some tools and link to xAPI demo site), part 3/4 (on connecting xAPI with LRS), part 4/4 (on learning design). The project started at the centre of ADL, and you can find many resources at the Experience API (xAPI) page here. And there is a wiki with lots of working documents and status details as well. For me, I am interested in the xAPI in combination with its mobile options for: tracking self-reported experiential learning, informal learning capture and 3rd party evaluation. Why? Because I am looking to build a research instrument which sort of combines classic 'learning logs' (i.e. diaries kept by the learner where s/he notes down what they have learned) and the qualtified self (a combination of the qualified and the quantified self which I wrote a post about here). And a really nice twitter implemenation example of the xAPI is described by the wonderful Mayra Aixa Villar in her blogpost #xAPI twitter chat - joint venture team - recap. What data is really important. What does the technical architecture have to look like in the next 5 year. Think about why I – Inge - want to use it? assessment tool, feeding in an Oracle system. This enables different yet not ideal dashboards analysing learning data. Currently the dashboards on LMS’s are not ideal as a UI. Roadmap towards 2018 advance analytics tools predicted. 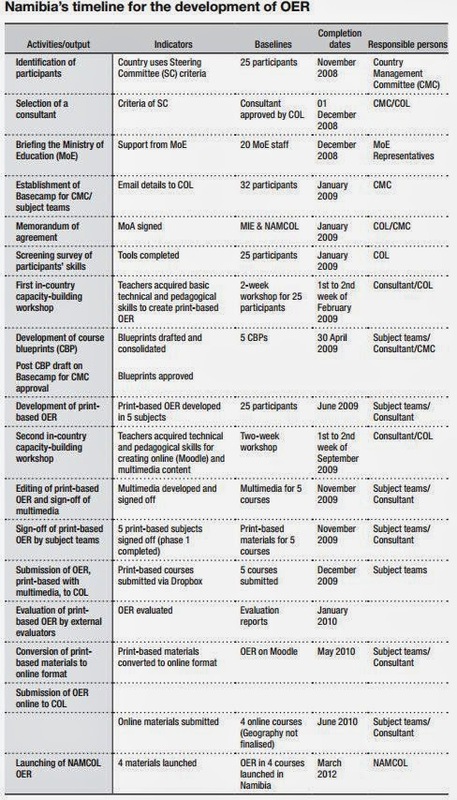 Concept of the never ending course (CPD – continued professional development with added spaced learning), this poses a problem for SCORM. Where people are at that point in time in their learning journey. 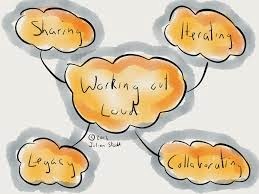 Reflection suggestion: what type of learning would be of interest to you taken into account the full personal, informal learning as well? What can be taken out of your community tools. What do you need to think about when looking for meaningful data/analysis? Iteration of tracking due to learning which data does matter, how tin can actually works, how to automate data tracking for self-reported and informal learning. The Beyond Prototypes report provides a UK-based in-depth examination of the processes of innovation in technology-enhanced learning (TEL) with a special emphasis on building online learning solutions that are durable. The focus is also on design-based research. In order to do this, the report looks back at some long-running programs (one going back to the 80's), and their follow-up projects. The report also looks at challenges and misconceptions of TELearning: e.g. 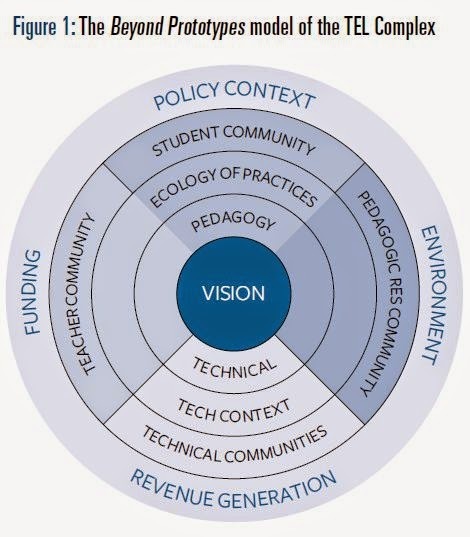 MISCONCEPTION: Most of the TEL innovation process takes place within universities. The £23 million Microelectronics Education Programme (MEP) for England, Wales and Northern Ireland was established by the Government in November 1980 and ran for six years. The aim was to support schools in preparing children ‘for life in a society in which devices and systems based on microelectronics are commonplace and pervasive’. To complement this work, the Department of Industry made £16 million available to help local education authorities purchase computers for schools. This project had follow-ups in European projects tackling education innovation. not to be the use of phones, but the provision of really engaging stories (some published in episodes), available easily and affordably, with readers able to comment and see others’ comments in near real time. the 17 months to December 2012. Securing further funding has proved challenging. However, content has been reused elsewhere, including by Young Africa Live, and the model has helped pave the way for other initiatives in South Africa such as the FunDza Literacy Trust. of cars and components were already used, nothing was available that could replace track time for drivers. inspired by an article about the use of eye-tracking systems in helicopter gunships. for coaching and mentoring in athletics and football as well as in motorsports. The interim and final results from design-based studies should be systematically shared with other researchers so that the process of innovation can be compared, expanded, and continued over time. They should also be widely disseminated to policy makers and practitioners, through events such as ‘what research says’ meetings. Research institutes should set up long-lasting collaborations and consortia, involving schools, museums and other educational settings as test-beds, to support large-scale comparative and crosscultural investigations. Policy and funding should support innovations in pedagogy and practice, as well as the technological developments that will support these. This should recognize the need to fund professional development of practitioners and evaluation of the innovation in practice. Policy and funding should recognize the importance of extended development and provide support for scaling and sustaining of innovations, beyond prototypes into educational transformations. Policy and funding should encourage the development of skilled, multidisciplinary teams that are able to complete the TEL innovation process. Recognition and support should be given to visionary thinking and experimentation, to generate fresh insights and achievable visions of educational developments.